You’re Invited to be part of history! Live video of STS-133 Space Shuttle Discovery Launch! On July 8th, 2011 (if launch remains on schedule) YOU are cordially invited to participate in the launch of STS-135, Space Shuttle Atlantis. For the last ten years, our NASA Aerospace Education Laboratory in Chicago was the pulse of mission control during daytime shuttle launches giving students an opportunity to not only watch a shuttle launch but learn the science, physics, and engineering behind the shuttles through hands-on activities in the AEL. 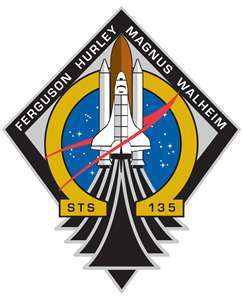 STS-132 was the last group of students to participate in a mission control shuttle launch experience in our AEL. In October, 2010 a new era in watching space shuttle launches began for me as a participant in the STS-133 NASA Tweetup. The delay of STS-133 to a February 2011 launch allowed me to introduce virtual participation for my students, families and communities which changed the experience of a shuttle launch from watching coverage on NASA TV or other online news sources to an experience of really being right there with me. I will be connecting schools, educators, parents, families and communities once again to share with me live coverage of the last space shuttle launch. On July 7th and 8th pre, live, and post launch events will be broadcast live on my Ustream, The NASA Lady, channel and on my Live! page here on the site. I’m encouraging everyone to watch, join in, and ask questions using the live chat feature. It promises to be not only a chapter in history that will bring to a close NASA’s human spaceflight program but a special time in history where we, as a collective humanity, will come together to celebrate the successes and scientific advancements and achievements as well as reflecting on the tragedies of the 30 years of the space shuttle program which reminds us that while going to space is dangerous it is the final frontier for humans to explore and that frontier will provide us with opportunities for a journey that will last far into the future. For our youth, we are heading into exciting times. While NASA is passing the baton of designing and launching human spaceflight vehicles to commercial companies, an unpresecendented number of opportunities in STEM careers and entrepreneurial ventures are opening. My generation watched and many of us took the leap to work for NASA as engineers, scientists, researchers, mission control specialists, education outreach specialists, contractors, etc., or even became astronauts! While the space shuttle never reached its original goal to make inexpensive weekly launches (estimated by NASA during the Nixon administration to cost around $7 million each and currently costing around 1.6 billion) into space a reality, the program has accomplished milestones including the launch and servicing of the Hubble Space Telescope, international cooperation in the building of the International Space Station, and launching probes to Venus and Jupiter. The shuttle program has also sustained a cooperative international working environment in space on board the ISS (International Space Station) and besides the human crew, STS-135 will carry a payload of cargo including a year’s worth of supplies, clothing, and equipment to the ISS. As NASA launches the final mission of its 30 year space shuttle Program and, at least for the near foreseeable future, our government goes out of the human spaceflight business and bring to a close another era in America’s space program, you can be there! I’m looking forward to you joining me on July 7 & 8. See ya live from Florida! 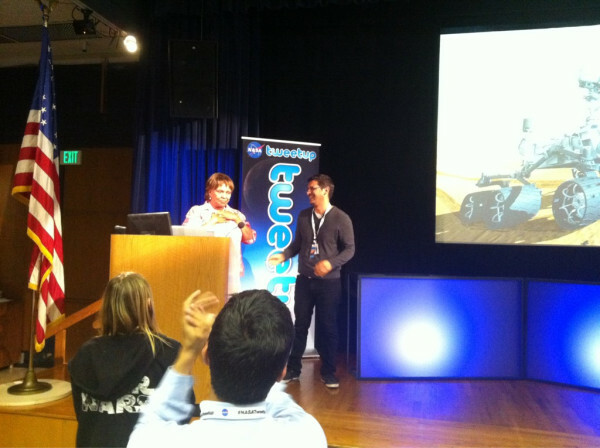 There haven’t been many times in my life when I can say that I’m, lost for words, but on Monday, June 6, 2011 during the NASA JPL Tweetup, I was completely overcome with emotion, gratitude, and such belief in how if you expose young people to knowledge they can take it to such great heights. Sometimes even as far as Mars! I love what I do, and yes, dreams do come true and they can happen to you! Thanks to my friend @theSuss for capturing the moment!